Did you know that almost half of the children in the United States aged 3-6 are in daycare? Maybe some of your homeschooling teens will join this mission field by serving in a preschool. Or maybe they will grow up, get married, and become parents. Either way, teaching Early Childhood Education in homeschool co-op is a great idea. And it’s fun! *Use 7Sisters Early Childhood Education text. It is fun, accessible and gives a solid foundation for ECE. Contact us for a special pricing for groups. *Make your syllabus. The course is designed to last 15 weeks and concludes with a presentation by your homeschool high schoolers. Early Childhood Education training or careers. There are many of them to choose. Here is a friendly video from the University of Delaware. Fun Activities for Preschoolers. Like this one. *Discuss the material in each week’s chapter. 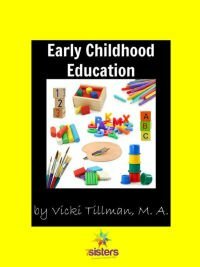 *Follow discussion with hands-on activities listed at the end of most chapters or fun activities from my Pinterest Early Childhood Education board and 7SistersHomeschool.com’s Pinterest board Homeschool Activities for Preschool. Your homeschool high school co-op or group class is going to be so much fun! Next Post: The Homeschool Highschool Podcast Episode 10: How to Throw a Terrific Graduation and Party!